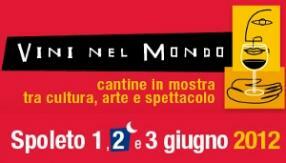 From June 1st to 3rd, 2012 Spoleto (PG) will become the Italian capital of wine, but also of the oenogastronomy excellences through 2012 Vini nel Mondo (2012 Wines in The World). The festival, now in its eighth edition, brings together the general public with the best DOP and IGP wineries and farmers' cooperatives. All in an enchanting scenery, the streets of the city of the Festival of the Two Worlds. In the 3 days you can taste and buy excellent labels and attend meetings, shows, special events and much more. Not to mention the "White Night", scheduled between the 22:00 of Saturday, June 2nd and the 02:00 of Sunday, June 3rd, 2012 with tastings, shops and clubs open and music. After the collaboration of the last edition, this year Gambero Rosso officially became partner of Vini nel Mondo, making the event even more a must for wine tourists. And not just for them.